Prime Minister's Erdogan's recent meetings with German Chancellor Angela Merkel and French President Nicolas Sarkozy have brought the Turkish government into meetings with Europe's top two leaders opposed to Turkish membership in the European Union. In France last week, Erdogan participated in festivities closing Paris' 9-month Turkish Season in Paris. Sarkozy did not attend the festivities, widely interpreted here as yet another snub. Yet, after a meeting with Sarkozy, the French president accepted Erdogan's invitation to come and see Turkey's progress for himself. Sarkozy has not visited Turkey since he was a small child, and Erdogan highlighted this point before embarking to Paris. However, unlike his predecessor, Jacques Chirac, Sarkozy remains opposed to Turkish membership, and is unlikely to be turned anytime in the near future. Erdogan also said he hoped to boost trade between Turkey and France from 10 to 15 billion euros. The two leaders differed on sanctions for Iran, Erdogan making headlines when he referred to Ahmadinejad as his "dear friend." Adding a historical perspective to Franco-Turkish relations, Today's Zaman columnist Ibrahim Kalin takes a look at the ties between the two countries. Repeating her "offer" of "privileged partnership," Merkel visited Turkey in an official state visit encompassing a variety of issues, most focused on of which was the issue of Turkish-language schools in Germany. In an interview with Die Zeit before the visit, Erdogan proposed that Turkish-language high schools be established for Germany's Turkish minority. The issue is, of course, highly-sensitive in Germany, and was interpreted by some in the Turkish press as a call for Turkish-language education as an alternative to German. In making his argument, Erdogan pointed to German high schools in Turkey's largest cities, which oftentimes only the richest and most elite students attend. 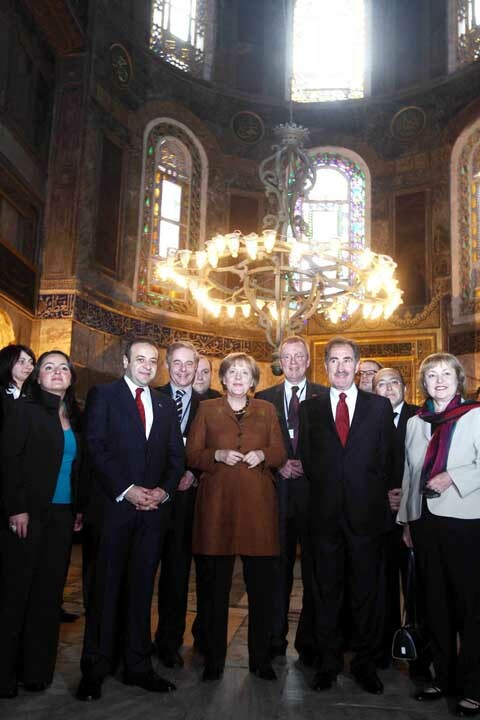 Merkel responded that there is nothing to prohibit the establishment of private schools teaching Turkish in Germany. Declaring education in one's mother tongue to be a bsic right, Erdogan made no reference to minorities whoare native in his country (and not immigrants) who do no receive public education in their own tongue. This point was not missed by some figures in the German press. Issues related to dual citizenship for German/Turkish citizens were also discussed, as well as visa-free travel for Turkish citizens. There are approximately 3 million people of Turkish descent living in Germany, and approximately 500,000 of them are German citizens. For more on the debate, see this piece in Der Spiegel, which also documents German press coverage, as well as this interview with former Chancellor Gerhard Schroder in Bildt. Merkel repeated her previous calls for privileged partnership, but reiterated that talks were open-ended. In an interview with Milliyet, Merkel said 27-28 chapters of the acquis could be opened. For news coverage of the visit, see coverage from Today's Zaman and this from the BBC. Also of interest is Der Spiegel's interview with Turkish-German intellectual Necla Kelek.